Dekevas is located on Gandhi Road and below the Dekeling Hotel. 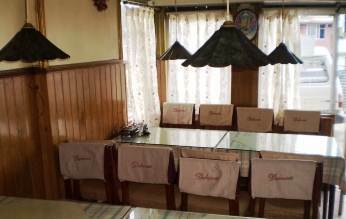 The restaurant is owned by a Tibetan family who also owns the Dekeling Hotel in the same building. Dekevas is a small restaurant with only few tables that can seat some 15 persons. In fact I have seen that they often join the tables on one side to create some space in the restaurant. This budget restaurant specializes on Chinese, Continental and of course on Tibetan dishes. They prepare the food fresh as you order. The kitchen is right behind the counter and you can actually see your food being cooked. This process is a little time consuming and therefore you will need some patience before you get your order served on the table. You may think that the service is slow, but this is how it works here. As you walk in through the glass door, the ambience inside is cozy and relaxed. On the right, there are couple of rows of tables where. In each row two tables are joined together so that a large family or a group can sit together. This is done probably also to make some space in this small restaurant. When the restaurant gets crowded, the guests need to share the tables. On the left side though, there are two independent tables that can seat 4 each. If you are looking for some privacy and little more leg room, then come early and take one of these two tables. Inside, the walls are wood paneled and the carved false ceiling also looks quite nice. There are ceiling lamps hanging over the tables. The cushioned wooden chairs are quite comfortable. The wooden tables have glass tops. Overall the restaurant is nice and clean. So what kind of dishes do you get here in Dekevas. Actually plenty in Continental, Chinese and Tibetan cuisine. They serve breakfast, lunch and dinner and are open all seven days. In breakfast they offer corn flakes with milk, porridge, toast with butter, and eggs made to order. You get tea as well. In snacks, they make different types of burgers and sandwiches including club and ham sandwiches. For lunch and dinner, you can start with a soup. Dekeva's Mixed Special Soup or Talumein Soup (non veg) are quite nice. There are vegetarian soups as well. Among the main courses you will get plain or fried rice, veg & non-veg noodles and chopsueys of different types, vegetable dishes including Mushrooms & Bamboo shoots, mixed vegetables, manchurian etc. Then there are great chicken and pork items in Chinese. They prepare the chili chicken really well. However their specialty items here are the Tibetan dishes. Try out the Chicken momo with soup or one of the Thukpas (noodle soups) like Chicken Thenthug or Veg Gyathug. The dishes are served piping hot and taste really great. There are other vegetable & meat preparations like potato with phing and mushrooms, fried meat etc. The restaurant also offers Pizzas of different types. If you are game for a pizza, then try out the Dekevas Special Pizza. It comes in both veg and non veg preparation. For beverages, Dekevas offers some specialty tea like Tibetan Butter Tea in a small flask, Tibetan Herbal Tea in a small pot, Green tea etc. Since the kitchen is right across the counter and the overall space being so small, the dining room can sometime become a little smoky and also smell of the food being prepared. If you can bear this, then this is a good budget restaurant to try out. The restaurant is right on Gandhi road below the Dekeling Hotel and is quite conveniently located. It is right opposite to the taxi stand and the car park on Gandhi Road and in a crowded location. Since the road is quite narrow here and the cars are parked right in front of the restaurant, there is hardly any space even outside. Next to it is the Kunga Restaurant located in the same building and offering another great option for Chinese and Tibetan food. Address: Dekevas, 51 Gandhi Road, Darjeeling - 734101, India.